According to the 2017 World Payments Report, a rise of 11.2% in online payment transactions amounting to 433.1 billion has occurred for the period between 2014 to 2015. The top contributors to this rise in non-cash payment activities are from emerging Asian markets. These types of economic gains will not be possible without the innovations in online banking policy and development of Internet infrastructure in the developing world. You may not have realized it but a major factor that helped propel non-cash transactions into its status today is the use of credit and debit cards. Financial institutions use debit cards to allow its customers to make real-time cashless payments in different stores. When using debit cards, the money is withdrawn directly from your own checking or savings account. This is unlike credit cards whose funds are obtained from a bank’s pool and you will get charged an interest rate if the amount owed is not paid back on time. Debit cards are usually issued by banks. However, designing them may be done by different partner merchants or organizations who partners up with the bank. This article focuses on different debit card designs and how each may be used for your business or financial organization. Simplicity is key. Bank cards follow a standard size of 9.3 inches by 14 inches. And this is already very close quarters. Therefore, avoid crowding the card face with design elements. Stick to the compulsory design elements like cardholder’s name, card number, bank logo, and the microchip design. Go crazy with the background image—or as crazy as you are allowed to. Most creative design elements happen on a debit card’s background design. Graphic designers may incorporate hand-drawn illustrations, vector images, gradient colors, and all other design elements that will help make the card design pop out. Make room for network stickers and/or logos on the card design. Debit cards, just like credit cards, may be used for cashless payments. In order for these transactions to work, a debit card needs to be registered to a payment or merchant network. The bank does all the registration stuff from their end. But for a card designer, you will need to specifically allocate parts on the card design where these network logos can be inserted. These logos serve as an indicator to where customers can use the card, so these additions should be conspicuous enough on a debit card design. Remember to also design the card’s back portion. A debit card’s reverse side will include the bank’s contact information, a blank space for the customer’s signature, and the card’s verification value (or CVV). Despite being relegated to the back portion, these pieces of information are still important. As a designer, you should use the same efforts in designing just like when designing the card’s front portion. Also remember to use the same background image on the card’s reverse side. Be prepared to redo your design. As mentioned earlier, financial institutions are like big machines where one gear needs another gear for a job to get done. This does not mean it is a bad thing. But in order for these firms to remain reliable and resilient in their industry, they need to rely on this process. That is why designing a simple debit card design may require countless revisions and approvals from different company higher ups before being fully approved. So be prepared for revising mock-up design after mock-up design. Prepare for the worst. And you never know, you may never have to do a revision since you created an awesome debit card design. The Steel Black Debit Card design featured above is reminiscent of exclusive credit card product lines that most banks and credit companies offer today. Financial firms who want their debit cards to exude the same feelings of exclusivity will benefit from using this card design. This is a fully customizable card design where you can change the name listed on the card, the card numbers, and even remove or replace the microchip design used to match your organization’s preferences. Another interesting feature of this debit card design template is that you may opt to remove or retain the shadows and highlights on the design. This is an important feature if you want to create card versions with a glossy or matte effect. 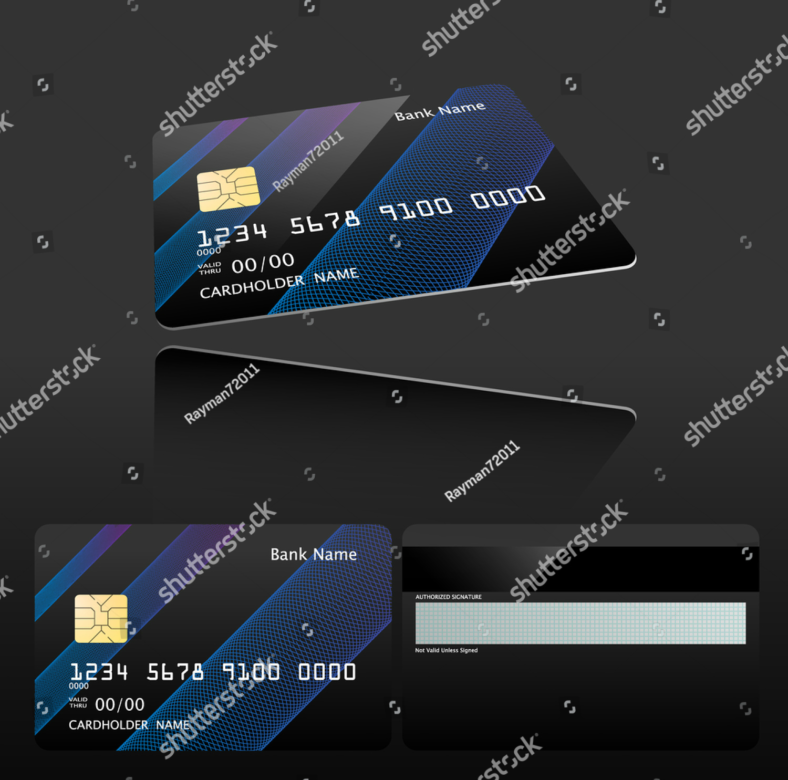 This Vector Debit Card Design template works best with a black background since this will highlight the different vector elements printed on the card face. 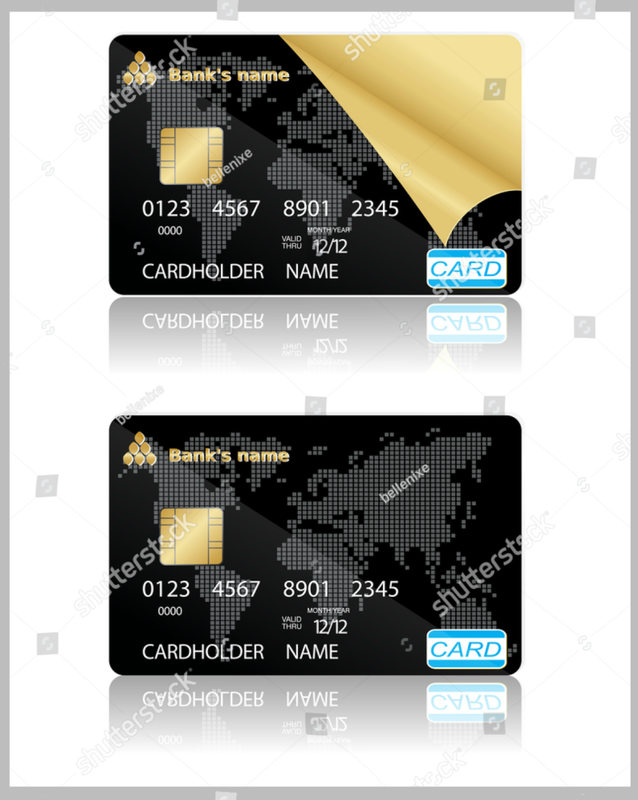 Banks and firms who already have swirl pattern elements in their own logo design will greatly benefit with this card design. Similar to other debit card design, you are free to change up the background colors, font style, font size, and image elements. The Realistic Debit Card Design template follows a subtle color scheme. And as its name implies, this card design aims to showcase an almost lifelike representation of an object or person on the card face. Financial firms who wants to create marketing campaigns using famous people and/or objects can plaster their images on the card without an issue. The Blue Debit Card Design is one of the few card design templates that helps create a sense of sophistication just by looking at its design. This design may be used as part of a customer loyalty program for debit card holders. Organizations who wish to inculcate a sense of pride and glamour as part of their company values will benefit by using this type of debit card design. An excellent example of a card that exhibits these effects are elite credit cards for high-earning individuals. This Silver Debit Card Design is a true example of a minimalist card design. It will work for different organizations and customer base levels since its color scheme has a universal appeal. If you are working for the graphic team delegated on working with creating a firm’s debit card design, this Silver Debit Card template should be among the top designs to choose from. Who says banks and financial firms are boring? Well, that can be true in some instances but not with the Creative Debit Card Design pictured above. The highlight of this card design is a swirling and almost endless loop of graffiti art. At first glance, the card design may look like a page from a Where’s Waldo (Where’s Wally for the British folks) book. But it’s not, it is a debit card design! Banking firms who wish to appeal to millennials or the younger demographic in general may benefit by using these types of creative card designs. It may take a while for any financial firm’s management team to approve such design choices but they will certainly pay off once approved and executed. 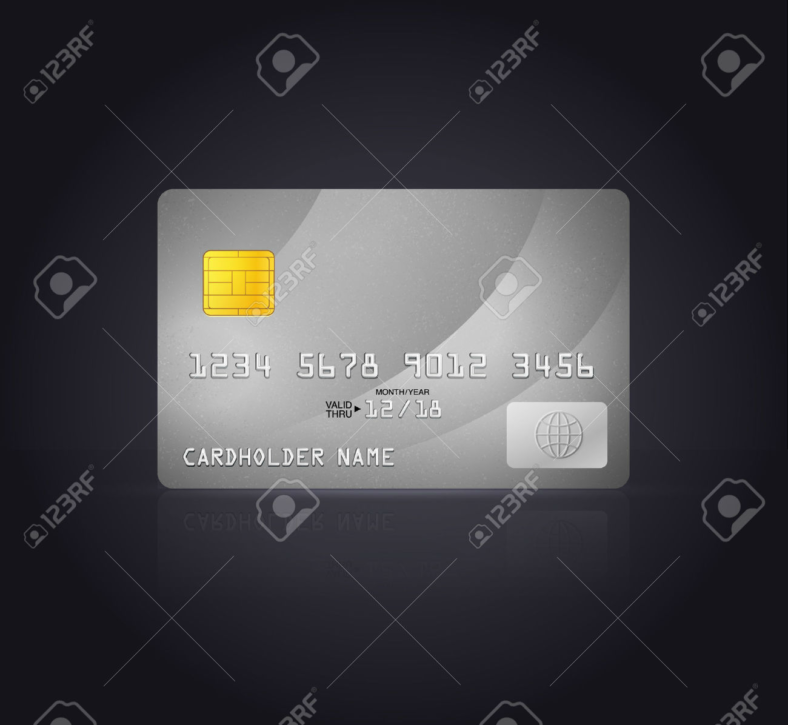 The Vortex Debit Card Design template features a vortex of tiny intersecting lines on its card face against a main background color of light blue. As with other blue-colored debit card designs, this type of card design allows companies to extend their influence toward a sophisticated (and perhaps high spending too) market share. The main color blue provides cohesion on the design that will help in translating a brand’s image. 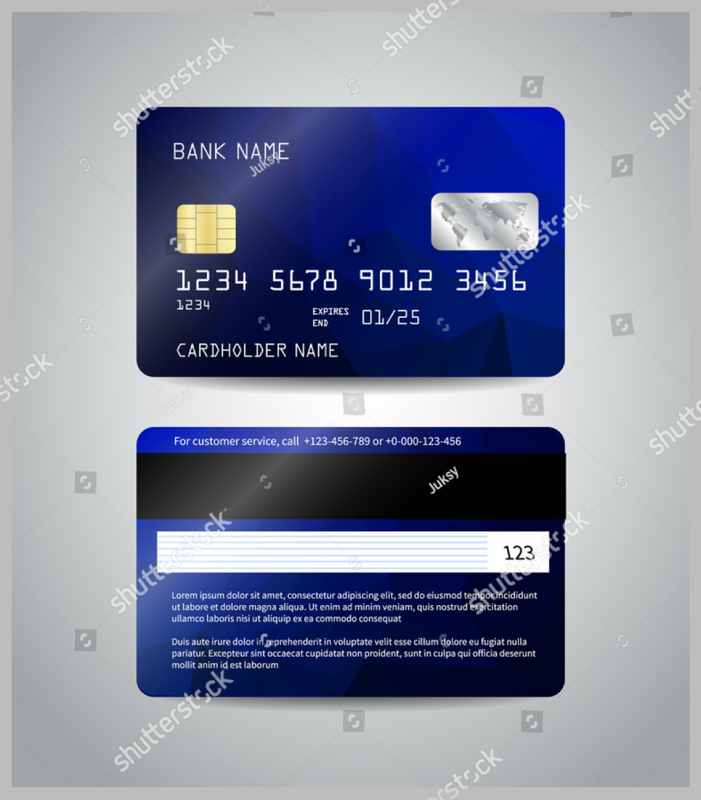 The debit card design template embedded above is fully editable and follows a general bank card size of 14 inches by 9.3 inches. Different banking icons may also be added into the card design if you wish to incorporate a company logo. 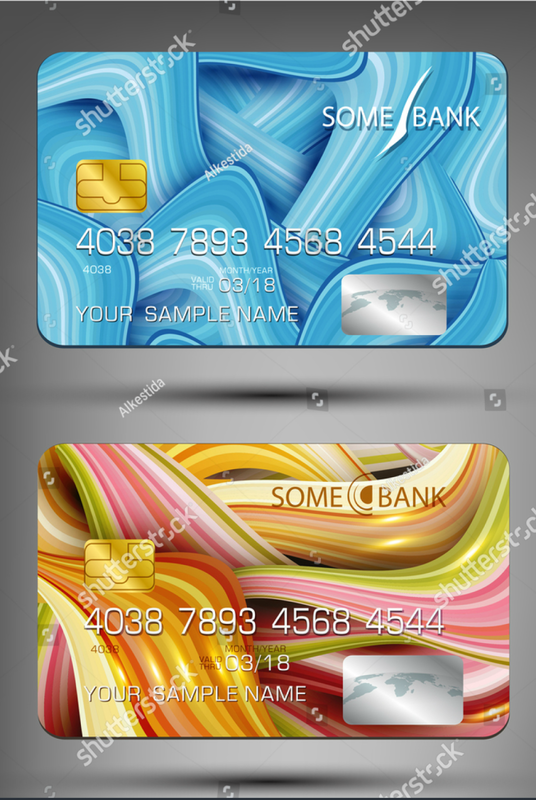 This Customizable Debit Card design is available in PSD file format. This way, you can modify key elements on the design and conform to your organization’s needs. 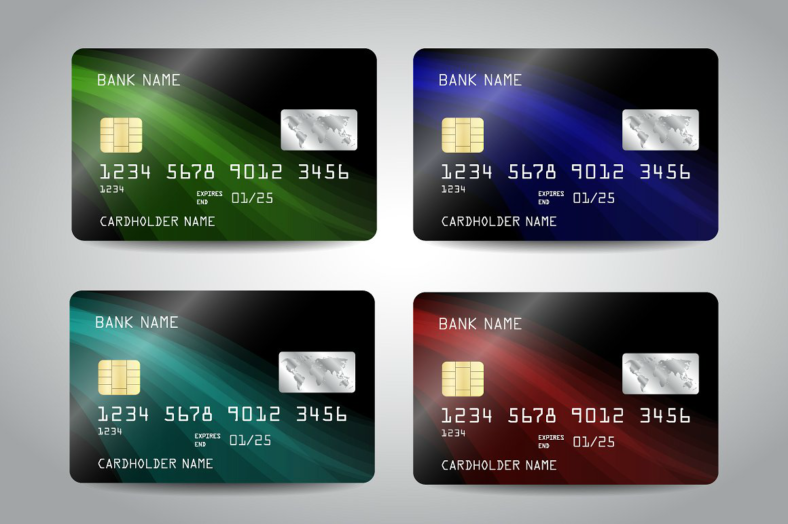 The Wavy Design Debit Card Templates as shown above features four card designs in four different color schemes: green, blue, teal, and red. Banking firms may release different colors of a debit card line to differentiate the different customer loyalty package tiers that their respective bank accounts are part of. Despite being touted as a way for keeping track of expenses, debit cards may still be used a primary form for cashless purchases. Using these cards may even translate to more cashless purchases. 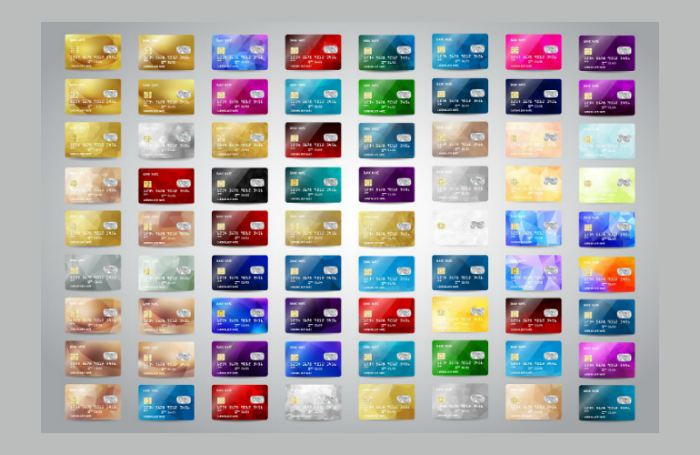 The set of Colorful Debit Card Designs shown above may suit firms who first want to see and choose among different card designs before settling on The One. 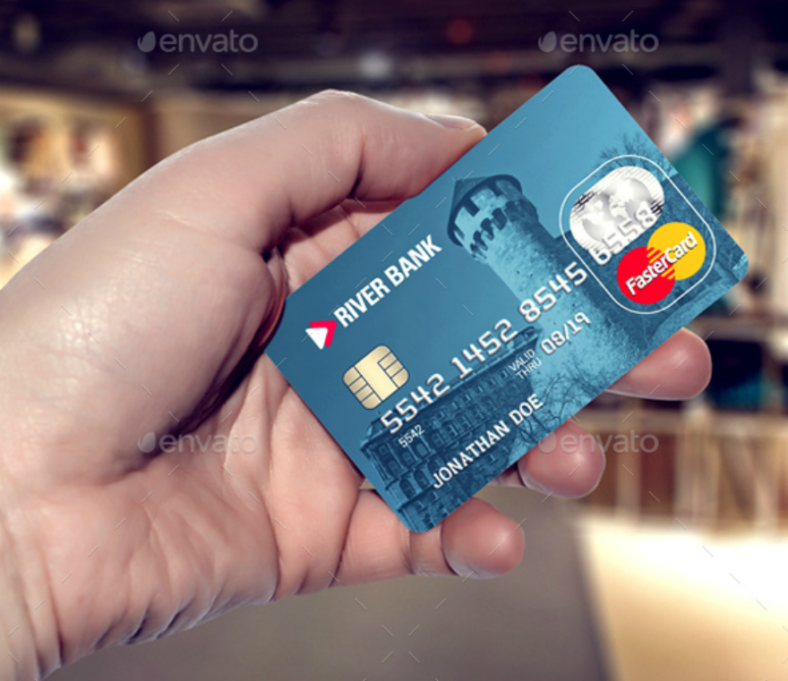 As a graphic designer dealing with financial firms wanting a unique card design (whether debit or credit card design), you will benefit with having an array of card choices like this at the ready. 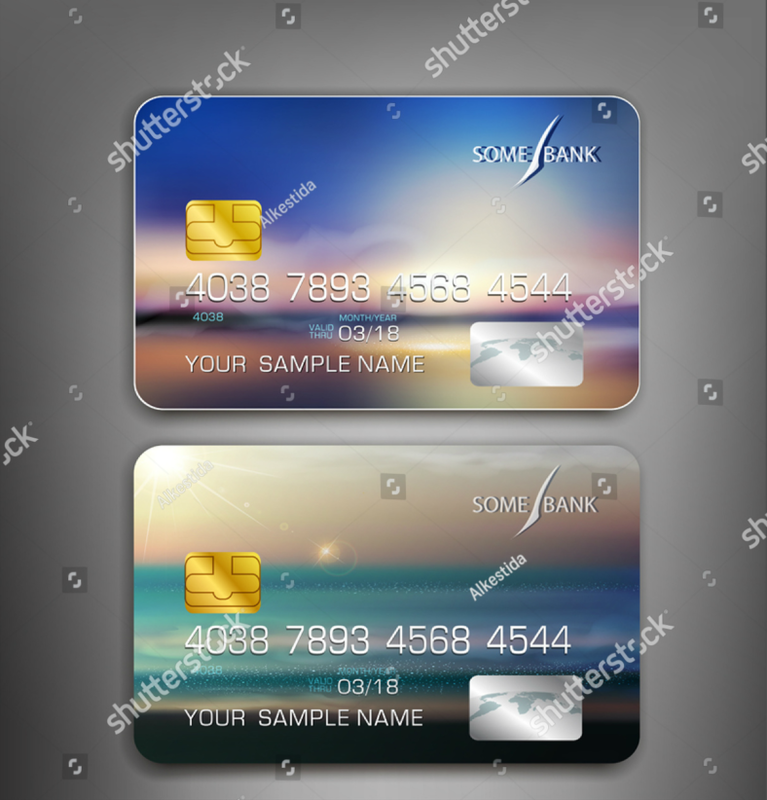 Banks may also even let their customers decide and let them choose the card design background image or color that they want. This way, banks (and their designers) will only get to pre-program the name, card number, chip design, and company logo designs on the card.